This is a member of the family Fabaceae, familiar to many people as it is decorative and widespread in rainforests from north-eastern Queensland to north-eastern New South Wales. 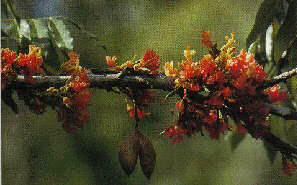 It has brilliant red or yellowish flowers that are nectar-rich and utilised by many of the canopy-dwelling nectar-feeders. 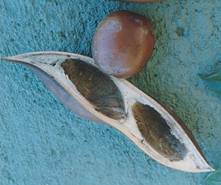 It also has large pendulous woody pods that enclose brown chestnut-like seeds. The 'Black Bean', Castanospermum australe is the only member of it's genus and is endemic to Australia. The leaves are bipinnate, with the flowers appearing in the late dry season or early wet season and are a spectacular collection of orange and yellow that sprout from the branches. The fruits are huge woody pods, shaped like little canoes, which break open to reveal 2 or 3 large brown seeds. The seeds were eaten by Aboriginal people in times of lesser food availability (after much treatment), while the pods similarity to canoes were used for exactly that by their children's dolls.